← Sunday Salon: Spoiler Warning? Many of you know that I’m not necessarily a fan of cheerful stories, in books or in films. But the movie of Enchanted April, which I saw long before I even knew there was a book, somehow got under my skin. Whenever I’ve got a case of the mean reds, watching it makes me feel completely soothed and comforted. The over-the-top beauty of the setting, the terrific performances, the extravagant joy of the piece just reaches right into me and makes me happy. 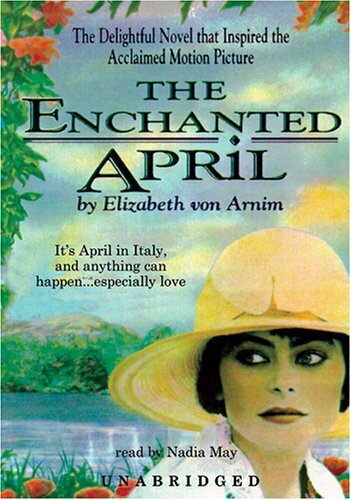 The Enchanted April is about four women, strangers to one another, who together rent a castle in Italy called San Salvatore. Each one comes to Italy with a specific heaviness in her soul, and the monthlong sojourn helps each one lighten her load in some way. It’s a lovely story, in both book and film. The film follows the book pretty closely (another reason I’m surprised at the dislike for the film). The actresses in the film don’t quite fit the physical descriptions in the book; Lady Carolyn in particular is different, not just in appearance but in demeanor. It’s hard to imagine Polly Walker’s Lady Carolyn being called “Scrap,” her nickname in the book. She’s too solid, not at all wispy. That said, I thought the film nicely captured the particular malaise each woman suffered. This explains why I liked the movie just as well as the book, but better? How could it be better? For me, the big difference between the two was in the length of time we spend in the characters’ heads. The film uses voiceover at times to let viewers into the characters’ thinking, but a book allows for more direct narration of the characters’ thoughts. I had two problems with this. One was that it was too much. It didn’t take me long to know that Scrap wanted to be alone, that Mrs. Fisher prefers the past to the present, that Rose is insecure about her husband, and that Lottie believes everything will come right in the end. I felt that Von Arnim spent too much time going over this ground again and again. It’s possible that seeing the movie ruined me for this aspect of the book. I knew before I started what these characters thought; a reader new to the story would not. Plus, the audio format did mean I couldn’t skim through the repetitive bits, so the musings over the same themes felt extra long, bordering on tedious. The other problem with getting into the characters’ heads is that there were some things I was better off not knowing. Lottie’s husband, Mellersh, is the principal victim here. On film, his character appears to develop beautifully, but the book makes it evident that he hasn’t grown as much as I’d imagined. The film, I should note, doesn’t contradict the book, but it keeps silent and lets me preserve the fairy-tale in my head. Von Arnim’s version of Mellersh is arguably more realistic, but the realism was a dampener to my enthusiasm. Even though I prefer the film, the book is enjoyable. I didn’t dislike it. It just didn’t enchant me. I liked the movie better than the book, too (print version), not sure why–maybe partly the visual beauty of setting in Italy was better evoked in film than descriptive writing? Anyway, glad to know I’m not the only one…. I think the visuals were a big part of it, yes. And maybe it’s that I fell in love with the over-the-top quality of it, which the book didn’t quite have. Hmmm … I haven’t seen the movie or read the book yet, and I’m wondering which I should do first! I have the book on my shelves. Probably I should read it first, since maybe I’m more likely to enjoy it that way, and I won’t run the risk of repeating your experience. And then I could watch the movie as a follow-up treat. I’m not sure how much of a treat the movie would be if you’ve read the book, but an unsatisfactory movie takes a lot less time than an unsatisfactory book, so I’d read the book first if I were in your shoes. At least if the movie suffers in comparison, you’ve only lost a couple of hours. I am firmly in the “skip the movie, read the book” camp. I think in your case it was getting to know the people through their acting. For me, the acting was just so…..artificial. I didn’t like the way the people I loved in the book were portrayed, maybe because I felt I knew them so much by reading their inner thoughts? I read it, not listened to the audio. Maybe listening just took too long, so those parts felt liked they dragged? I read much faster than I listen so that happens to me sometimes. I’m sure your right that part of it was that I fell in love with the movie versions of the characters, and the inner thoughts did drag in the audio, especially when some of the thoughts, like Mellersh’s, were so contrary to what I’d imagined. Interesting about the Christian imagery. I do agree that it’s in the movie, but I wouldn’t call it obvious.There was a lot in the book about Rose’s inability to pray, and there’s a strong implication that her church work is part of the problem in her marriage. One could see that as an attack on religion in general or on legalistic religion. I tend to go with the latter explanation (and I think that the movie supports that as well), but the book pushes a little more toward religion itself being the issue. That wasn’t part of my disappointment with the book, I should add, but it surprised me. And LOL about Lem! I can see that–something in his facial expression. This is one of my favorite books. I’ve never seen the movie; not sure now if I want to! Harrumph. Sometimes the original format of anything is the one we end up liking best. For me this is not only true with book/movie partners but also with recordings of classical music. The version I hear first is the one I like best even if I find others later that are truer to the composer’s intentions. I would also suggest that you have yet to read the book, perhaps something didn’t work in audio version that would have worked better on the page? I absolutely agree that it’s probably as much about the movie being my initial exposure to the story as anything else. It’s certainly not a reflection of the book’s quality! I do think that the lengthy reveries went on too long on audio. Reading is print goes more quickly, so it would have been less of a problem. The production itself was quite good. It is definitely rare to like a film over a movie but you are proof that it does happen. I’ve neither read the book or seen the film but you have made me want to do both! And both are well worth doing! I am one of those past commenters who didn’t enjoy the movie version very much, but I haven’t read the book so I had nothing to compare it to. The movie just seemed so campy and fake, I couldn’t get into the spirit of it. I do have an ebook version of the novel now, so I think I may try it at some point just out of curiosity. I like the idea behind the movie so I feel like the book may work for me… I guess only time will tell! Campy? Fake? Nay! Over-the-top maybe, but gloriously so! Obviously, I got caught in its spell. The book is more subdued, though. I’m in the U.S., so I can’t watch the new Downton season until January *sob* But I think Elizabeth and Her German Garden is on my e-reader. I agree with Thomas that sometimes what you are first exposed to becomes a favourite. That happened to me with The English Patient. I haven’t seen or read this one yet (but I do have a copy of the book) so I’m planning to read it before seeing the film. I agree. I think the fact that I’ve loved the movie for years and years had an affect. I haven’t read the English Patient, but I wasn’t super-enthusiastic about the movie (which is why I haven’t read the book). Loved the book, thought the movie was so-so but didn’t hate it. Very brave of you to admit you like the movie better but sometimes these things happen. I could not get into the Stieg Larsson books and quite the first one after 60 pages. But I loved the Swedish films of them. I actually heard very good things about the Swedish films of the Larsson books, even in comparison to the books. I have no interest in the books, but I do have the first movie in my Netflix queue. I’ve now read the book (as you know) and seen the movie! and I loved the movie but I preferred the book. I was bothered by Scrap being so un-scrap-like, much preferred her in the novel — and felt that everything was much more subtle and intense in the written version, though of course if was wonderful to see Italy looking so lovely. 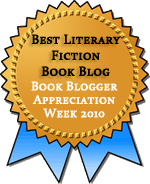 And by the way I have read and enjoyed Larsson and also seen all the films, which I thought quite good, though again I liked the books better. I definitely think my feelings about Scrap has a lot has to do with my having met the film version first, so I already liked her and wasn’t bothered by the departure. But I agree with you that both versions are terrific, and I’ve been surprised at how unenthusiastic people are about the movie. Wow, I found the book so very enchanting, I’d better get hold of the film! I have had that happen to me a couple of times, and usually when I’ve seen the film first, and read the book later. Big exception: I Capture the Castle. As much as I heart Romola Garai, I was left puzzled by the film, but a few years later I was completely enraptured by the book.